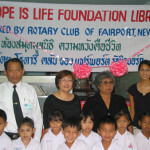 Hope is Life Foundation opened another library for children in one of the learning centers in the Minburi province of Thailand with the help of the Rotary Club of Fairport, New York, USA. There are around 16 learning centers in this area, where around 80 children aged three to six receive early education supported by the government. The children come from underprivileged family backgrounds. Hope is Life provided more than a thousand donated children books in Thai and English to the day care center. In addition to opening a library for the students, the Foundation has developed a plan for senior students from the neighboring Ruamrudee International School to visit the learning center once a week to spend time with the children teaching them songs, games and elementary English. During the opening ceremony for the library, the Chief District Officer, Khun Krit Vacharasiritam, praised the efforts of the Foundation to help Thai children in their education. Bangkok Governor, Khun Apirak Kosayodhin, also visited the Learning Center and met with Natascha Yogachandra, Hope is Life’s Honorary Chairperson. Natascha Yogachandra is seen with the Bangkok Governor, Khun Apirak Kosayodhin, (extreme right) with other government officials at the learning center.